Well, this post is a little different from some of my past entries on real animals, like spiders or tarantula hawks – those posts are about real-life traits of real-life animals that happen to be monstrous. This post is about a made-up trait of a real-life animal. That’s right. I’m putting salamander myths in the hot seat. There’s a longstanding myth that salamanders can survive very hot temperatures – or even handle being on fire without breaking a sweat. Sometimes the legend goes as far as to say that salamanders are born of fire. This myth shows up all over pop culture. Look at Charmander, a “fire lizard” Pokémon – we’ll let the lizard vs. amphibian issue slide, because that’s pretty low on Pokémon’s suspension of disbelief scale. Harry Potter’s Fantastic Beasts and Where to Find Them (the book, not movie) states that salamanders live in fire. That’s only one of many fantasy stories to borrow this idea, and it’s far from the first. Likewise, many fantasy games include fiery salamanders as enemies – the very first edition of Dungeons and Dragons, for example, says that their human-lizard hybrid salamanders are from the elemental plane of fire. The earliest recorded culprit is Pliny the Elder. He’s one of the usual suspects for weird monster legends that trace back to the first century AD. Pliny actually recorded some zoological observations that were ahead of his time – for example, he correctly identified that salamanders were different from lizards. However, he put creatures like gryphons and cyclopes in his Natural History alongside, you know, giraffes, lions, and other things you might actually expect to see at a zoo. You can see how that might have caused some confusion. The Romans are far from the only ancient culture to associate salamanders with fire, though. Several centuries before Pliny made these claims, Aristotle confirmed that fire-proof salamanders were a rumor among Greeks at the time. The Talmud also claims that salamanders are born from fire, and their blood can be used as a ward against burning. But let’s get back to those Greeks, because another one of their early philosophies added fuel to the fire – uh, so to speak. You may be familiar with the ancient Greek idea that all matter is composed of four elements – earth, air, fire, and water. It’s another theme that’s absolutely everywhere in pop culture. Well, that philosophy was still going strong during the Renaissance many years later. A sixteenth century alchemist named Paracelsus decided that there’s a single elemental being that embodies the traits of each elemental force. Earth had gnomes, air had sylphs, water had undines. 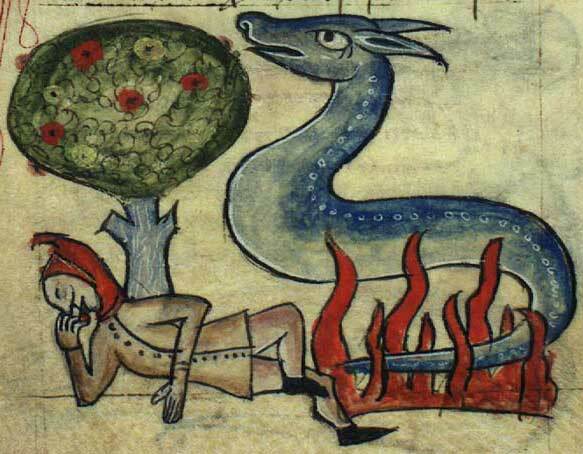 For fire, it was salamanders. Now, salamanders have the unique distinction among that group of also being real animals. As opposed to, say, lawn ornaments, or spear-wielding fish girls. But that wasn’t necessarily an advantage for living, breathing salamanders. The scientific method may have been a long way off, but the curious minds of the medieval and Renaissance eras had gotten as far as the “experiment” part. That meant people tossing innocent amphibians into the flames to see if they really could survive in fire. Presumably, some did. For a few seconds. You might think this kind of thing would dispel the myths, but they stayed strong. Even Leonardo da Vinci claimed that salamanders could sustain themselves off of fire instead of, you know, a digestive system. Why did these myths stick around for so long? In part, it could just be that the cultural stories about salamanders have been around so long that they stayed around. Even now, when we have scientific evidence that salamanders are normal amphibians and not magic fire spirits, we suspend disbelief to tell fantasy stories about them. But until more critical scientific methods came about, plenty of observers actually thought they had evidence of fire-dwelling salamanders. The most likely origin of the story comes from salamander real estate practices: they like to hang out in rotting logs. You know – the kind that you might decide to burn if you were making a campfire. People picked up these logs and didn’t see the camouflaged, sleeping amphibians. Set the house on fire? They’re going to come running out. As far as the fire-builders knew, the salamanders really did appear from the flames. So… good thing we’ve got that scientific method thing, or we might still be chucking them into bonfires. Salamanders aren’t really monstrous in a philosophical sense – either in real life or in their fiery mythical incarnations – but the myths sure are strange and exciting. It’s a nice change of pace to have a supposedly mythical creature around that you can really go out and look at, even if you won’t see it doing anything supernatural. Kind of like the cats have nine lives thing turned up a notch. What? Not all of these posts have to be scary. Sometimes it’s nice to appreciate our species’s ability to find magic in the mundane. Or condemn our ancestors’ pre-scientific superstitions and tall tales.